In Tiburon, Blasen's lush hardscapes and shaded lanais have come of age. 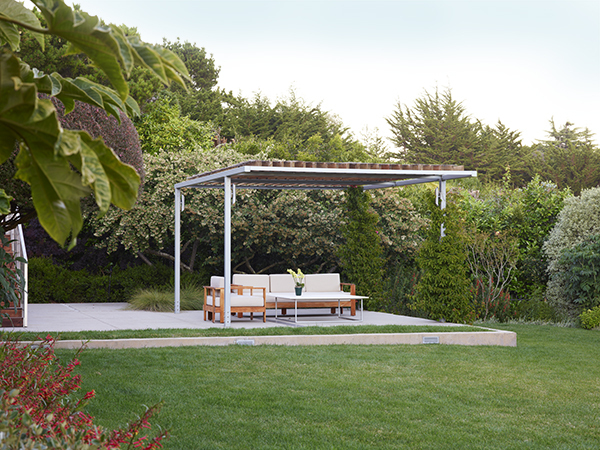 ABOUT A DECADE AGO, before California’s recent dry spell, the San Anselmo firm Blasen Landscape Architecture designed a modern drought-resistant garden in Tiburon that was well ahead of the curve. What’s more, the designers Eric and Silvina Blasen, a husband-and-wife team, aimed for a lush tropical style with just a few plants and vast hardscapes that required little water, and the plan clearly worked. It began with the globe-hopping clients, Michael Grant, an investment manager from Canada, and his wife, Jenny, a business consultant from Malaysia, who fell in love with the tropics after a holiday in Costa Rica. After living for many years in London and Taipei, they moved to the Bay Area, where neither snow, smog nor bugs get in the way of living and entertaining alfresco. “This area has cultural values — a connection with the environment, healthy eating and outdoor living — that, especially in a major metropolitan center, are unique in the world,” Grant says. “In London your house becomes filthy just by your leaving your doors open, but here we can realize the promise of indoor/outdoor living. The wind brings in nothing but fresh air. Now, wild grasses, sun-loving hydrangeas, agapanthus, hibiscus, iris, purple salvia, bird-of-paradise, large-leaved green goddess lilies, showy Clerodendrum quadriloculare, Russelia equisetiformis, lively Penstemon blackbird and other such stalwarts thrive in terraced planters alongside formed concrete stairways and pathways that the Blasens created. Indeed, the garden, resting on the half-acre hillside lot facing bay views, comes alive with seasonal color. Its discrete outdoor “rooms” include an entry court off the street and a back garden — replete with a vegetable patch, a concrete fire pit, built-in cedar benches and a silver powder-coated steel trellis topped with natural cedar 2-by-6-inch planks — that are conducive to outdoor living. On the west side, toward the views of the city and the bay, is another lanai-like steel-and-cedar pavilion on a plinth for larger gatherings, surrounded by a down-sloping lawn of hardy fescue grass on which the Grants’ sons Sean, 17, and Lachlan, 12 — who have known this garden for most of their lives — have run free. Fragrant honeysuckle vines and high shrubs, on the west edge, act as wind shields. “Even at the entry, we were trying to create a composition of textures and movement,” Blasen says. Thus, the former driveway, now entered through a cedar gate, is covered with 4-foot-wide asymmetrical individually formed poured-concrete pavers floating in a bed of easy-to-walk-on pea-shaped gravel; a formal bosque of maple trees will someday provide an even fuller canopy in this courtyard. “It was also about creating permeable yet easy-to-maintain surfaces,” Blasen says. The pavers are interspersed with aluminum trench drains laid in long strips to create a rhythmic pattern and lead the way to the front door and down a flight of stairs to the west side lawn. The materials used for the hardscape — concrete, rocks excavated from the site, steel and cedar — echo those San Francisco architect Peter Pfau used when he remodeled the 1960s ranch house nearly a decade ago.